It all started with a dream back in 1981 when Knut Kjenslie wanted to make flying a career instead of being employed as a Structural Engineer at Martin Marietta in Denver, Colorado. Knut and Ingrid Kjenslie purchased the flying/soaring business at Flying Seminole Ranch, Oviedo, FL. in August 1981. They traveled caravan with Knut driving the Ryder rental truck towing a station wagon while Ingrid driving the family car with their 2 children Tara (3 yrs), Aaron (1 yr) and Duchess, the English Sheepdog. There, the Kjenslies’ operated a Cessna Pilot Center and Glider operation until 1989. In 1987, it became clear that the airspace surrounding Orlando International Airport would become a TCA, requiring all aircraft to have transponders. This airspace would encompass Flying Seminole Ranch and would make it impossible for soaring at this site. A decision was made that Knut and Ingrid wanted to continue the soaring business so they embarked on trying to find land outside the 30 nautical mile radius of Orlando International. It took almost 2 years of looking for land that could be attainable, right size and a price that would be feasible. They found the “For Sale” sign in pouring rain on Thanksgiving day 1987. It was pasture land used for cattle and other farm/ranch use. After 6 months of Knut and Ingrid going to the county, negotiations, hearings, etc. as well as dealing with Southwest Water management, all the required approvals and permits were met and Seminole-Lake Gliderport was born. The name came from Seminole (as in Flying Seminole Ranch in Seminole County and since the new location was in Lake County) – The name became Seminole-Lake Gliderport. It was designed to be a fly-in community along with the Soaring operation. Knut dropped the Cessna pilot center, making it exclusively a gliderport. The runway was created along with the road . It took 8 months for the grass to grow which was durable Argentine bahia grass used at golf courses. Seminole-Lake Gliderport became operational July 1, 1989, Knut’s birthday. 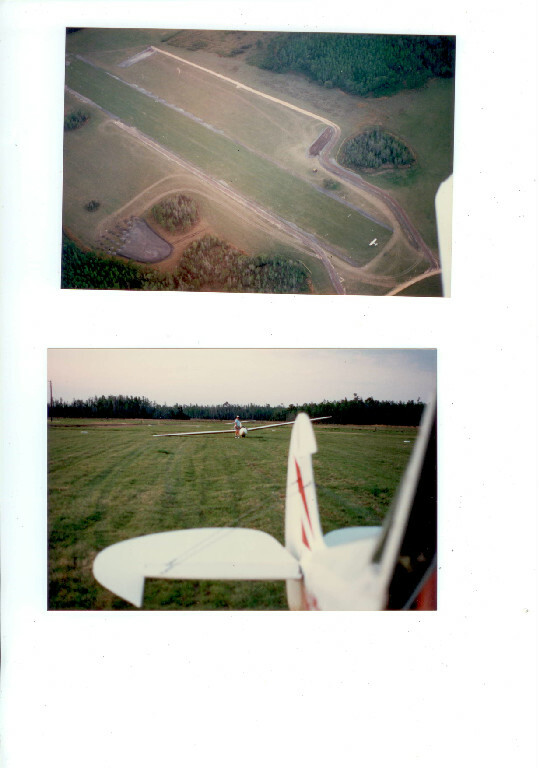 With the help of fellow friends/pilots a towplane along with several gliders were flown over from Flying Seminole Ranch. Operations were week-ends only until September when Flying Seminole Ranch was closed and Seminole-Lake Gliderport was operational 6 days per week. At this time only one hangar was built and the office was in a mobile home. Shortly after the office (including 2 guest rooms) a swimming pool, T-hangars and private home was built. At a later date, another 6000’ hangar was built. In all, 12 homesites were sold and to date, 6 homes have been built. With the great winter soaring, a new surge of pilots started coming down to learn to fly gliders or to stay current during the winter months. Competitive glider pilots also came to SLG to keep the winning edge before the spring soaring. It was with this an idea was born. 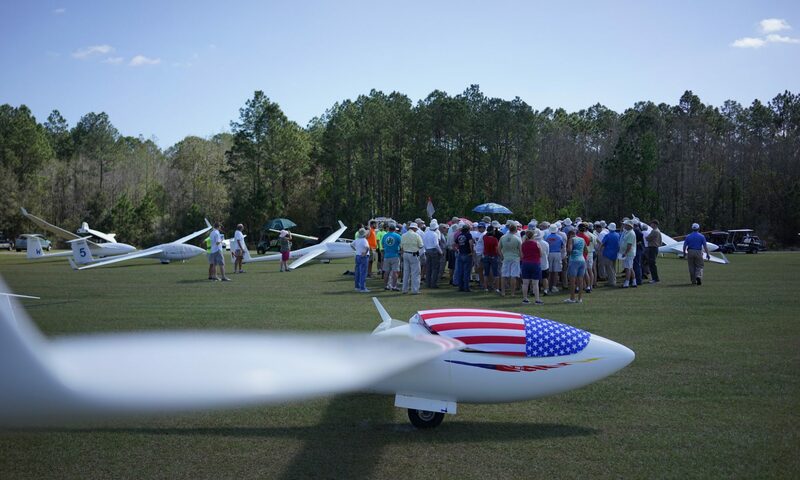 There was an interest to have a contest in the winter to kick the Soaring Season off and what could be better than to have in sunny Florida. 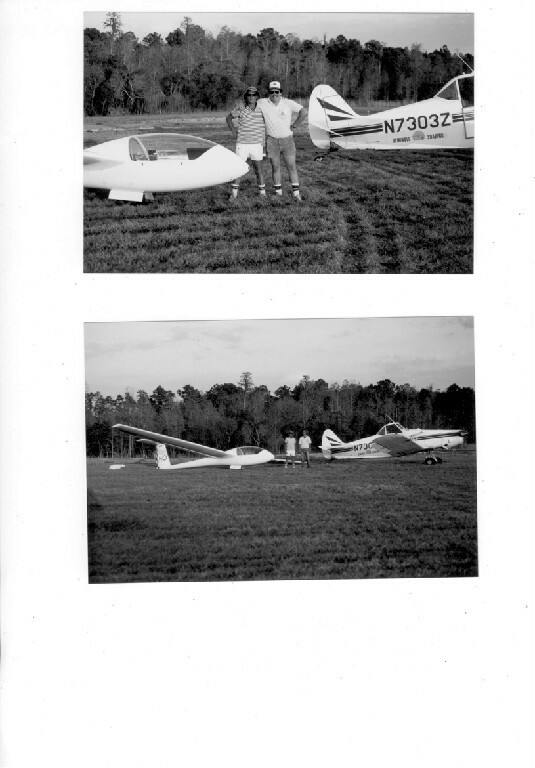 Together with Charlie Spratt and Tom Knauff, Seminole-Lake Gliderport hosted its first Annual Senior Soaring Championship in February 1991. The rules were unique compared to other soaring contests. Rule #1 was you had to be 55 years of age or older. This has become perhaps the most popular contest in the U.S and has been a yearly event ever since. In 2008, Mihai Tanjala purchased Seminole-Lake Gliderport along with the business Seminole Flying & Soaring, Inc. Mr. Tanjala and his family are from Romania and are continuing to actively operate the glider operation with plans to expand. Part of their team is Aaron Kjenslie, towpilot, who grew up on the gliderport, took his nap in the towplane with his Dad at 2 yrs old and soloed in gliders at 15. Over the years, great publicity was welcomed. Many T.V. Stations around Central Florida including Tampa did segments on soaring, Newspaper and magazine articles all over the country and world including Sourthern Living, Airline magazines and European Mercedes Bends. We also had Actor Cliff Robertson doing flight currency, Ed McMahan (Johnny Carson’s sidekick on the Tonight Show) and others less known. Since starting Seminole-Lake Gliderport, approx. 150,000 tows, 1250 glider ratings, and 20,000 Glider rides were given, as well as other training. SEMINOLE LAKE GLIDERPORT was purchased by Mihai and Niculina Tanjala for their daughter Alexandra, who, at that time was a student at the Richard Stockton college in New Jersey. Alexandra wanted to continue her math studies in the U.S. and also have her own business. As life always has bigger plans than your own, Alexandra decided to manage a large corporation in Romania. Seminole Lake Glideport continued to be managed by the former owners Knut and Ingrid Kjenslie, and later by Alexandra’s sister Andreea and her husband Florian. The Tanjala family, as aeronautic enthusiasts, have made it a priority to keep the traditions of a 30 plus year old business, while improving and developing it at the same time. While Andreea managed Seminole Lake Gliderport, she brought a lot of brand recognition and has done an amazing job at organizing the Seniors National Championship, which also brought recognition from the SSA and FAA. Mihai is very fortunate to now have the opportunity to organize more competitions such as the 13.5 meter super regional and Cross Country glider racing Camp. Since Andreea has had a tremendous impact on the business, she has made sure to keep flight security her main priority, while bringing awareness to the schools in Lake County and getting children interested and passionate about flying.